Our hectic schedules usually make us look forward to something worth waiting for, like long weekends at home or birthday salubongs at the beach. Sometimes, however, we also have to acknowledge our day-to-day victories. Granted, these achievements aren't much, but they're actually the ones that matter in the long run. If you manage to skip the EDSA traffic and are still able to feel the sunlight in your skin, you know the universe just gave you a major break. Bring out the wine and cheese! You must know by now that a work to-do list equals an overwhelming inventory of never-ending tasks. However, once you’ve ticked off all the boxes on your checklist, you deserve to sit back and relax without any worries. You bought a new shirt for 50% off and your office crush thinks it’s nice? Score! Take advantage and celebrate. Yeees! You've resisted the temptation of unli-rice meals and buffet invitations. After a long and stressful day, don’t you think you deserve to drink something that’s good for your heart? Nothing feels nicer than to see your superior give you a pat in the back. That’s something you should be proud of. Cheers! It goes without saying that traffic can really test your nerves and patience. But if you drive from Makati to Quezon City without any side comments or rude remarks, you can use a reward once you get home. It takes a huge leap of faith to add color to your usual eat-work-sleep routine. If today you decide to try a difficult sport or an exotic dish, you deserve to pop open a bottle! Scary taxi holdup stories and other modus operandus make even commuting horrifying. If you arrive home in one piece, commend that simple moment and be grateful. Sometimes, you don’t need life-changing accomplishments to make you feel good. If you're in a light and joyful mood today, there's no reason for you not to celebrate! The week before payday a.k.a. petsa de peligro brings out the kuripot in all of us. But if you actually manage to save up, then congratulations—you've finally learned how to be responsible. You need to toast to that! These occasions call for a major toast, don't you think? Good thing we know where to go wine shopping. From October 2-11, Marketplace by Rustan's branches in Power Plant Mall and Central Square BGC and Rustan's Supermarket branches in Glorietta and Shangri-La Plaza Mall will be having a sale on over 100 wine brands, courtesy of the Rustan's Supermarket's Happy Wine Festival. Here's to the everyday stuff! 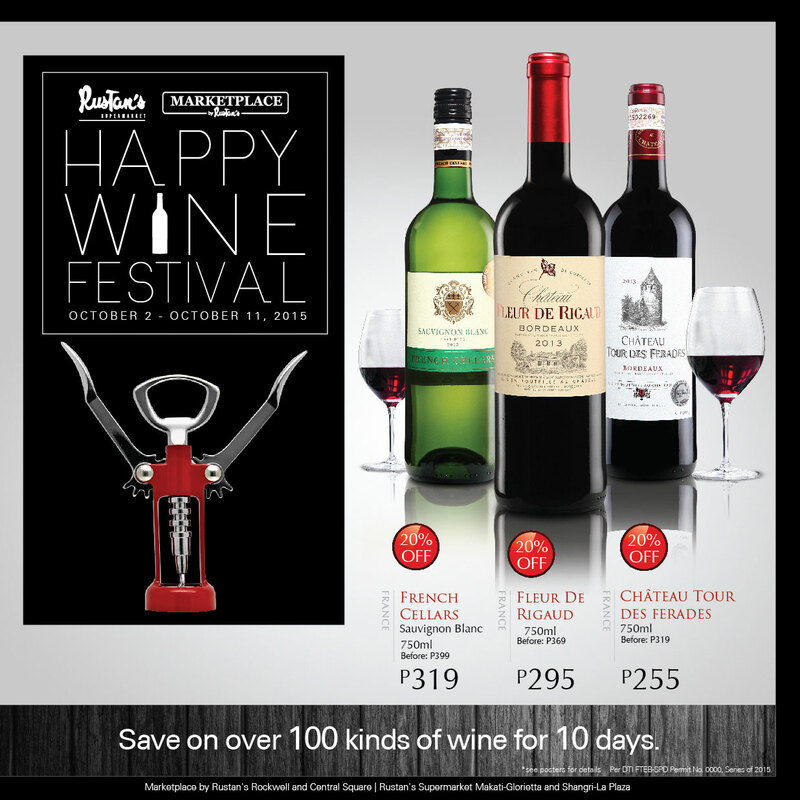 To know more about the Rustan's Supermarket's Happy Wine Festival, click here.